For over a week, I have had no access to my wordpress.com blogs. I maintain four. This is one of them. Then we have one for our family (bobandceliamunson.wordpress.com). Then we have our main ministry (bukallife.wordpress.com). Finally we have our local (Philippine) church. (westbaguiobaptist.wordpress.com). Some I do a better job of updating than others. So for about 10 days I could not open these blogs, nor update. Rather frustrating. But then today, I have access again. Great!! So I was all ready to start putting down things in my blogs when I realized that I had nothing to say. That is odd. I normally have quite a bit to say… if not every day, at least every 3 or 4 days. It is not to say that there hasn’t been things that could inspire topics. My Missions History (master level) class is just finishing, and my Cultural Anthropology (doctoral level) class will start in a few days. I have been working slowly on a book for pastoral care in the Philippines… and have been working especially hard on pastoral assessment. But nothing jumped out at me to put in a post. It occurs to me that I think by writing to some extent. My thoughts do not coalesce unless they go through the process of being put into written form. Additionally, however, I find it difficult to push through the process of writing down unless there is (the possibility at least) of readers or listeners. It is not the number of readers that matters, nor even the reality of readers. It is the POTENTIAL of readers that can motivate to write. I am not so sure that this is unusual. There are relatively few Emily Dickinsons out there… writing at a high level with no plan to make the results available to the eyes of others. So… NOW that I am in the middle of typing, it occurs to me what I really want to say (I had no idea when I started). I don’t know about in other countries, but in the Philippines, missions teaching and missions writing are dominated by foreigners. A lot of bible schools don’t really pay much of anything for teachers… even less for missions professors. Why? One can get a foreign missionary to teach the class for free commonly (since they are externally supported). Publishing houses in the Philippines commonly publish foreign works… republishing in some cases foreign works, or new materials written by foreigners living locally. It is hard to make money writing in the Philippines so the ones that can write are often those who don’t need financial remuneration. The result, to me, seems to be cyclical. Foreigners (in missions) write and teach, taking away the need (and incentives) for locals to write and teach missions. This creates a lack of qualified locals in missiology, resulting in a vaccuum that is filled by foreigners…. and around the circle again. Some things can be done to improve things. Local publshing can actively seek local writers. I know of some schools that pay the same amount (either salary or honorarium) to all regardless of whether a foreign missionary or not. That removes the temptation to make teaching decisions, either way, based on cost. Don’t get me wrong. I live as a foreign missionary here and enjoy teaching and writing. I also believe that we all learn by the “cross-pollination” knowledge… meaning that there should always foreign reflection and local missions reflection in any cultural setting. However, if it becomes to lopsided there can be problems. If either local or foreign reflection has all incentives removed… something valuable is lost. Found some great missiology resources on Slideshare. I was looking for a good presentation on “The Great Century” in Protestant Missions. There is very little available. 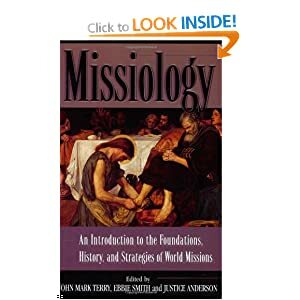 But then I found one on Slideshare, and figured out that most of the presentations in this collection are tied to chapters of “Missiology: An Introduction to the Foundations, History, and Strategies of World Missions” edited by John Mark Terry, Ebbie Smith, and Justice Anderson. The presentations don’t have photos… which really is not such a bad thing since the content is solid. The book and the presentations have a clear and obvious Southern Baptist perspective (fine for me since I teach in a couple of SB schools, but not for everyone). 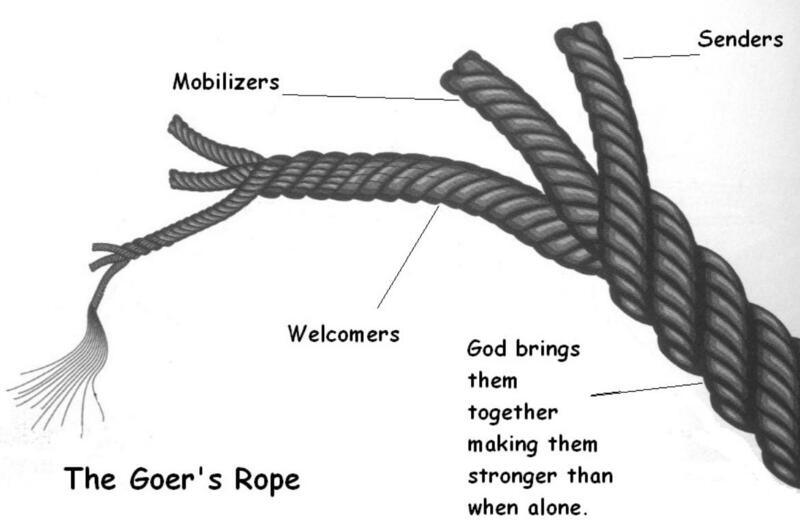 The rope can represent the coming together of such support. warm, but how can one be warm alone? But for me, none of these applied. Actually, I was (and am) a committed Christian in faith and practice. I do not believe the religion I created. Nor do I seek others as adherents. I used to discuss religion a lot in the Compuserve Religion forum. I found that people had trouble talking about religion because people are emotionally invested in their own religion (even people who claim to reject all religions, are invested in their own non-religion). For example, I was surprised at how quick Mormons were to take offense (“Mormonbashing”) about almost any challenge of their beliefs or basis for their beliefs. Rather than dealing with these issues of hypersensitivity, it can be easier to talk about religious issues that are not directly tied to a specific religion. It helps to have a religion that no one believes in, or hates. I used it on a couple of occasions… but eventually during one of my many computer upgrades I lost the information I had, and then Compuserve shutdown and data dumped. But I remember it something like this. The religion’s prophet had the name “B.B. Blitt.” He believed in a god, but I don’t remember the name of that god (the name started with a “B” like most aspects of the religion). Essentially, that god, for lack of a better word, “blew up,” ceasing to exist as a sentient being. However, that explosion created the Universe, essentially from what might be loosely described as the “body” of that god. The life force and mind of that same god is fragmented and exists in the living beings scattered throughout the Universe. The end of the Universe results in the big crunch as the “body” reforms and the life force and sentience returns to its source and coalesces. Up to that point, it is an incomplete theological structure because it only answers a small number of the great questions. What fills it out is the belief of B.B. Blitt that we have a part in the character of the reforming god. As we do evil, that small spark of psychoemotional lifeforce in us becomes more evil and that evil spark ultimately will join up with all of the other sparks to make up the reformed god. As we seek peace and good, that heals that spark and positively transforms this god. B.B. Blitt sought to teach people how to positively transform this god. 1. Why are we here? We are fragments of god… somewhat of an accident, yet with ultimate purpose. 2. Where are we going? We are returning to god as a tiny drop in the great sea that is god. 3. What is my purpose? To be part, ultimately, of god, and to live a life that makes god better. 4. What happens when I die? My lifeforce ultimately returns to god… perhaps losing personal identity, but joining in the overall identity of god. So what? I guess a few things come to mind. 1. I have long (always?) believed that we are inherently hard-wired religious beings. Perhaps 60 years ago (roundabouts) there was a common belief that religion was dying away and the future would be unreligious. That has not happened because we appear to be designed to seek to find meaning. Empiricism simply does not provide meaning… merely facts (or at least probabilistic “facts.” This leaves people with the need to seek meaning elsewhere. 2. It is interesting to me that people have in recent years incorporated interesting spins on religion in science fiction… and not simply some form of technopagan “swords and sorcery” variety. Religion is sometimes attacked for focusing on old stories and old books. It is interesting to see the interest in not only “future religions” but the interest in some of the beautiful messiness found in religious life. In the case of the Church of the Broken God, there are already three major factions with very different beliefs and structures. 3. I do wonder if there may be theological value (as a Christian Contextual Theologian) in studying intentionally fictional religions. Because of their intentionally fictional nature, their highly fanatical adherents don’t actually exist… allowing for one to deal with them contextually in somewhat of a laboratory setting. I know we have used case studies in cultural anthropology to aid in applied work. Case studies are commonly realworld… but one can imagine situations where fictuional case studies could be of real value. I know we have used games like “Rafa Rafa,” a fictional cultural simulation, for issues of acculturation and comunication. Perhaps learning from intentionally fictional religions (philosophical basis, canon, culture, and ethics) may help us understand how our faith affects who we are, and how we can and should relate to others of different beliefs. Missions is not only about understanding one’s faith, but understanding the faith of others… even those whose faith stretches one’s own credulity. We need to find ways to learn and grow. Perhaps testtube religions (and cultures) can help. Giving the Devil his due… sort of. A couple of things have come up here that bring up issues regarding demon possession. One was some discussions on-line that point out that a large percentage of Evangelicals in US do not believe in “mental illnesses” but believe that such phenomena are demon possession or demon oppression or such. The other was a training at seminary here about the relation of psychology and theology, and demon possession came up as an issue. I suppose I should care about the issue, being involved in a counseling center. I should care … both as a question of reality, and a question of perception. After all, I live in the Philippines where paganism, as well as folk Catholicism, and American-made Christo-paganism, are pretty big. Being honest here, howeve, I don’t really care. Maybe I should. A few indidents soured me to the topic. I read a Christian book on demonism when I was in college decades ago only to learn later that the writer was a fraud. Then I read a book by the most popular Protestant exorcist (at the time at least) in America. His poor scholarship really bothered me. Later, I was forced to attend a “deliverance service” (I was an employee at the place). People were barking like dogs, twitching, and screaming and such. It seemed strange to me that people connected the weirdness with God and worship as revealed in the New Testament. Studying theology in seminary, it became pretty obvious that much of the commonly revered beliefs in the area of demonology are based on tradition and theories that have gained credibility by verbal repetition, not by sound exegesis. A few months ago, I was asked here if I wanted to attend an exorcism. Truthfully, I have no more interest in that than I would have in attending an interpretive dance workshop. So my comments here are based more on analysis than experience. But I do have some concerns or issues even in my ignorant state. 1. Symptomology. A concern I have with the “diagnosis” of demon possession is that it seems to base symptoms on Biblical descriptions from 2000 years ago. Why is that a problem? Because the two defining features of demon possession (if it is a literal, rather than metaphoric condition) is: (a) the “disease” is a sentient being, and (b) it is a “disease” with the possibility of having an individualized agenda. Why does this matter? Because if demon possession is a literal condition of a non-corporeal sentient being with an agenda inhabiting or oppressing an individual… there is no reason to assume symptoms would be consistent. In fact, one would have to assume that symptoms can and do vary (in fact there is considerable variation even in the New Testament). Today, in first world countries, the manic state sometimes described as demon possession as seen in the New Testament would be of no use. A wild person would simply be packed away in a mental institution and kept drugged passive (“doesn’t matter who is sitting in the driver’s seat when you remove the spark plugs”). Any purpose of the demon beyond residency would be wasted. Here in the Philippines where the manic often still share the streets with the rest of us, it is possible that such classic possession might be witnessed because it could have some affect in the culture. In first world nations… one might see a “Columbine”-type incident as closer to what one could suspect as being a more effective demonic activity, and so a more likely symptomology. 2. Externalization. A problem I have with those who are quick to identify demon possession (or more commonly oppression) is that it often comes off as an excuse… and opportunity NOT to grow and learn. Generally in counseling situations it is useful to determine what things one has responsibility over and what things one does not. With demon oppression, one is not really responsible for one’s feelings or actions, but one is not even responsible to confront an offending party (beyond paying an “expert” to confront in one’s place). My fear is such externalization perpetuates a sickly spiral. I have seen those interviewed on tv who keep going back to be “freed” again and again from demons. I feel like they have grabbed hold of a diagnosis that allows them not to change (because they have no responsibility in the matter) and are receiving a treatment based on a probable misdiagnosis. I have also known people who seem to always be “hit up” by demons. One I know seems to have regular problems with the “demon of despair” or the “demon of procrastination.” Not only is this Frank Perretti-ish view of the world not well-founded Biblically, but (again) it seemed to be a way for him not to deal with some easily identified issues in his life. 3. Mental Illness Diagnosis. Some Evangelical Christians like to make the argument that there is no such thing as mental illnesses. Rather they are issues of sin (in some cases… it certainly could be, or at least triggered by personal sins, being sinned against, or living in a generally sin-damaged world) or of demons (who knows?). The first problem is that mental illness do absolutely exist– they actually have to. Why? Because mental illness are not things of substance but are simply labels of loci of symptoms. They exist as a definition, by definition. In this sense, you can “create” a mental illness as well. Simply take a collection of symptoms and give it a name. The question is not whether mental illnesses exist. The question is whether they are useful. The usefulness points in two directions… causation and treatment. If a mental illness has a cause, it can be prevented, or at least minimized. If it has a treatment, it can be cured or at least managed. The question is not whether a mental illness exists but whether it is useful. If it does not point to a reliable causation or treatment, it is not a useful label. To simply gainsay a mental illness label without reviewing its effectivity in determining causation or treatment is… well, it’s pretty lazy and potentially damaging. The same is true on the religious side. Jobs friends sought to label Job’s condition (boils and other crises) as having sin as its causation. Others in the New Testament sought to label a blind man’s condition as from personal sin or that of his parents. Both misdiagnosed. And in misdiagnosing they had the additional failing of providing a flawed treatment plan. The same concerns exist in demon possession. If it is misdiagnosed, there would be an error in causation (thus potentially leading to recurrences) and error in treatment (leading to perpetuation or even exacerbation of the problem). 4. Ambivalence: I see a lot of what I might call… ambivalence… regarding the demons in the Bible. Take for example the relationship between demons and idols. In the Bible, there are references that demons are associated with idols. Deuteronomy 32:16-17, Psalm 106:35-38, and I Corinthians 10:20 are the most direct (although the hebrew term for demon, sedim, in Deuteronomy and Psalms may not have much to do with our present image of demon). But the majority of Biblical texts point to idols as being nothing more than human construct… having no power whatsoever. Jeremiah 10, Isaiah 40, and Habakkuk 2:18-19 are among many to focus on the powerlessness of idols, rather than some connection to demonic powers. Paul’s theological construction on meat sacrificed to idols starts from the premise that there is no power associated with idols… except the power people give them to affect their own minds and consciences. So how does one reconcile demons and powerless idols? Perhaps the answer is that demons are powerless. Or perhaps the connection to idols is a rhetorical device rather than a statement of reality. This sort of thing is found elsewhere in the Bible such as in Isaiah 46:1-2 where the Babylonian gods Bel and Nebo are looking down from the heavens unable to protect their own idols from harm. The rhetorical device contrasts useless, powerless gods (and demons?) of pagan idolatry with the one true God, Yahweh. Or perhaps something else. There is also a bit of ambivalence between illness and demons. Some problems in the Bible are clearly identified as demonic (such as the demoniac of the Gadarenes). Some seem to clearly have nothing to do with demons (the injured man in the parable of the Good Samaritan, or at least 9 of 10 Egyptian plagues). Some illness are not identified as to their basic cause (the woman with years of bleeding, Lazarus’ illness). Healing in the Bible varies wildly as well, from public health and quarantine practices to medical first aid, to a wide variety of different miraculous practices. One is left with the realization that IF all illnesses are demonic in origin, there there is simply no consistency of treatment for demonic oppression. One can use medicine, public policy, or miraculous activities to get rid of demons. I am reminded of the story of Capo de Vaca (“Cow Head”), a man who was supposed to have been stranded with some shipmates in precolonial Florida. They travelled across what is now the southern United States to get back to “civilization.” To survive they were forced (“do it or die”) to act as exorcist healers by the native peoples. Perhaps their strange appearance and language made them seem good candidates for this role. Capo de Vaca noted with surprise how effective they were. These were not necessarily pious men. They were sailors and as a former sailor myself, I can vouch for their probable impiety. One, in fact, was a Muslim conscript. They used the religious symbols and prayers they knew. Many were healed this way. Was this God empowering them? Was this demonstration of the power of the faith of the recipients? I don’t know… ambiguity again. Clearly it was not the faith or piety or methodology that gave them success. 5. Charlatans. Let’s be fairly obvious right now. Much alternative medicines have aspects that are beneficial. The problem is that one does not always know which ones are useful, on what occasions they are useful, and who is trustworthy in carrying out the diagnosis and treatment. Since exorcism, especially in Protestantism, is a rather self-appointed role… it lends towards charlatanism. So even if there are legitimate exorcists and legitimate uses of exorcisms… the question is whether one could wade through the cesspool of frauds, and the less unpleasant, but still dangerous, kind-hearted but self-deluded practitioners. Conclusion: So what do I suggest (in my own way based on limited experience)? I would suggest the recognition that God, others, and the internal assets of the client are always potential aids in dealing with mental problems. As such, presuming a treatment that takes one or more out of the picture is unhealthy. If the physiological and psychoemotional symptoms suggest a diagnosis with a treatment regimen… it is most often wise to test the process. However, that should not be done in exclusion to the person’s faith, effectively including religious rituals and symbols in the life of the client, and the role of God as healer. Now I know some of you don’t believe kites can think and speak. To be honest, I don’t believe so either. However, let’s just assume that this one particular kite could, to avoid unnecessary arguments later. A family that loved to go to the park owned this particular kite. On a fine windy day, they would go to the park and launch their kite into the air. These were glorious occasions. As you might imagine, the life of a kite tended to be quite dull most of the time. As the wind caught the kite and sent it (seems strange to describe a kite as a he or a she) hurtling into the air, it really felt alive, and maybe in a sense it did become alive. The kite looked around in wonder and thrilled at the twists and turns it could make while tethered to the ground. The kite was very happy. He was up a couple of hundred feet, yet it seemed like miles. But then he noticed them. As more line was let out, it got closer to some of the clouds. It could see that the gusts of wind that would send it twisting would pull off wisps of cloud and fling others together. It soon became clear that the clouds were not things of themselves, but a loose collection of unrelated things. The clouds would change in shape and would grow and shrink based on laws of turbulence and thermodynamics. I am not sure of the kite’s educational experience so I don’t know how much of this it understood. It watched further and saw one cloud come its way. It was lower than most of the rest. It soon became clear that the kite was going to be hit by this cloud. It did not know whether to be excited by the prospect or terrified. It had hit the ground a few times before, and did not like it. However, what did it feel like to be hit by one of these big white things? Wishes are funny things. Maybe they have no value or maybe they do. But sometimes wishes come true sooner than one would ever dream. In this case a gust came along and the knot that held the kite to the string gave out. In an instant it was free. However, before the kite could really begin to appreciate this new-found freedom, it sensed lack of stability in its flight. The wind began to toss and twist it violently and it soon found itself plummeting to earth. However, the kite never made it to earth. It hit the upper branches of a large oak tree. There it stuck with its crossbars broken, tail ripped off, and sail torn. There it stayed for months as the elements broke its body down. Now, however, it rarely watched the clouds. Rather, it would love to dream as it watched kites dance in the sky. This is a story I wrote a few years ago. I am preaching on Sunday and the topic is on the call of Jesus to deny oneself, and to take up one’s cross. To me, this includes sacrifice and willingness to suffer. But beyond that it also involves knowing one’s place or role in God’s kingdom. To deny oneself removes pride and covetousness (seeking what others have and one lacks). It also recognizes that constraints, limitations, unpleasant circumstances may actually exist for our own good. I decided not to use this story in my sermon… but it does remind me to appreciate God holding my string as I dance in the breeze. I have been reading Christopher Wrights’s book “The Mission of God”… I am a slow reader. But I was also reading a review of that book by Trevin Wax… actually a very good review… but there was a part that got me thinking. Trevin was noting some disagreement (or apparent disagreement) with Wright’s focus on holistic missions (as opposed to “spiritualistic missions”). But if eternal suffering in hell is one of the motivations for evangelism, then it should follow that evangelistic outreach is of the utmost importance. Political and social activity will be of eternal significance only insofar as they demonstrate the truth of that evangelistic message. In other words, the weight of eternal suffering ought to make ultimacy pulse with passion for proclamation and demonstration – not as if they are two equal planes that need to be kept upright (one temporal and one eternal), but in seeing everything related to mission as ultimately designed to proclaim the gospel that relieves all suffering, especially eternal hell. Therefore, it is not enough to say that mission is deficient if it does not contain gospel proclamation. We ought instead to say that mission is non-existent if our deeds are ever disconnected from the motivation and intention of proclaiming the gospel verbally. John Stott would describe spiritualistic (or proclamation) ministry and social (demonstration) ministry as being two wings on an airplane (or a bird), are two blades for a pair of scissors. But the reviewer is suggesting that the implied symmetry is misguided. One is clearly more important than the other. So for him, the plane model is inappropriate, and scissors (symmetrical) should be replaced with shears (that are typically assymetrical). 1. Two wings gives to impression that proclamation evangelism and demonstration evangelism are connected (in the middle) and aid each other but are otherwise independent of each other. For example, I think few of us could imagine a bird (let’s use a falcon as an example… why not?) that could fly if it only had one wing. We probably are pretty convinced that a one-winged falcon could not fly. However, we probably can imagine a falcon with only one wing. A one-winged falcon would still be a falcon, even if it could not fly. But I would suggest that proclamation without demonstration is not evangelism and is not missions. One is reminded of the “gospel bombs”– paper gospel tracts dumped into people’s back yards in the short story “The Gospel Blimp.” This, and other forms of “evangelistic littering,” is something… but it is not evangelism and it is not missions. Donating money to a secular charity is nice and it is kind and it is loving… but it is not evangelism and it is not missions. Prayer walking may or may not have value… but it is not proclamation and it is not demonstration. It is not missions or evangelism. It is now something else. 2. The two-wings metaphor suggests that holistic missions can be discretized… disconnected into two separate things. The term “holistic” (I do prefer the spelling “wholistic”) fights against this. It suggests an integratedness, a gestalt, a synergy, that defies dividing them into two camps. Successful missions is neither really proclamation nor demonstration….. but RELATION. Relation cannot be broken down into words and actions… they join together inseparably. While I understand that from a taxonomic standpoint, one could possibly separate mission/evangelism into two categories… the question is, is there any usefulness in such categorization (functionally speaking)? I think the usefulness is often lost in the confusion it creates. 3. As noted before, there is a huge inequality between the two wings. In the quote above, Trevin noted that if one views eternal destination as more important than present circumstances (an understandable viewpoint) than proclamation must be seen as the more vital. But one can reverse it pretty easily to suggest that the other side is greater. Consider the argument used. One side is proclamation… but what does that entail? Wing 1: “verbal communication of adequate facts/data to allow another to make an informed decision whether or not to follow Christ. If that is how the two wings are divided, Wing 2 would take up most of the activities of any evangelizer or missionary no matter how much one tries to focus on Wing 1. One may seek to prioritize Wing 1, but in the end, Wing 2 is likely to be dominate in one’s time and effectiveness. The question is whether one does Wing 2 well or does it poorly. The two wings are unequal in various ways. As such the model is challenging. An additional assymetry is effectivity of separation. Wing 2 (Social ministry) without Wing 1 (proclamation) is clearly inadequate. However, behaving in a loving manner to those who need such love, but without proclamation of the gospel), while (again) inadequate, at least can serve as a preparation for the gospel. Wing 1 (proclamation) without Wing 2 (social ministry or demonstration) may be effective in some circumstance. However, it is also quite likely to lead to rejection. How many non-Christians have been turned off to the gospel by people who preach up the love of Christ, but are not able to live out the love of Christ. The first scenario is inadequate but neutral to somewhat positive. The second scenario ranges from negative to positive. On the other hand salvation comes from a response to a message, not to demonstrated love without the object of that love presented. 4. Talking about which is more important is ultimately foolish. Looking at point #3. In terms of adequacy, proclamation is more important… the message is adequate for response, while this is not true of demonstration not linked to the message. On the other hand, in terms of size of ministry, social is greater. And in terms of effectivity, social is greater (in the sense that proclamation is more harmed by divorce from its partner than is demonstration). The two wings suggests, incorrectly, that one can do one or the other or both. In the quote above the reviewer rightly noted that demonstration without proclamation is not missions. But he needed to go further. Proclamation without demonstration is not missions either. Doing one without the other is not Christian missions. Trying to do proclamation without demonstration is difficult, and likely to backfire. Arguably, it is impossible since to proclaim without focusing on demonstration (“social ministries”… everything on Wing 2) simply means to demonstrate poorly. To demonstrate God’s message poorly is to effectively preach against one’s spoken message. And to demonstrate God’s love without God’s message of hope is so incomplete as to arguably not ultimately be missions. Ultimately, I would suggest a different metaphor… not to replace the wings, but to supplement them. I would suggest the metaphor from James of a fountain. or a spring. James 3: 11-12 suggests that we cannot use our mouths to both curse and bless. After all can a single spring bring forth both fresh and salty water or both sweet and bitter? Of course, we know that people both bless and curse with one mouth. The point is that it is unnatural… a violation of how things are suppose to be. Let’s bring the idea of a spring over to evangelism or missions. A. A spring has a source… which in this case is God and God’s mission. B. It has an outward flow from a place of abundance to a place of lacking. I would argue that this flow is love… relational. God loved us first, and we respond with love for God and love for who and what God loves. The reality of hell, for example, may inform the message, but should not compel the action. Likewise, the Great Commission may inform our methodology, but it should not be our motivation… one simply of duty. Love compels word and action. C. To love halfway… such as loving with word that is disconnected from deed, or deed disconnected from word… is unnatural… and a violation of what it truly means to love just as it would be unnatural for the spring to be both salty and fresh. Ultimately, I believe the reason we have these arguments is that we don’t truly love those around us (yes, I am including myself here). Therefore, we find ourselves playacting… guessing at… how one is supposed to act if one loves. Does one focus on words? Does one focus on doing nice stuff? Does one focus on programs, formats, or anything else?